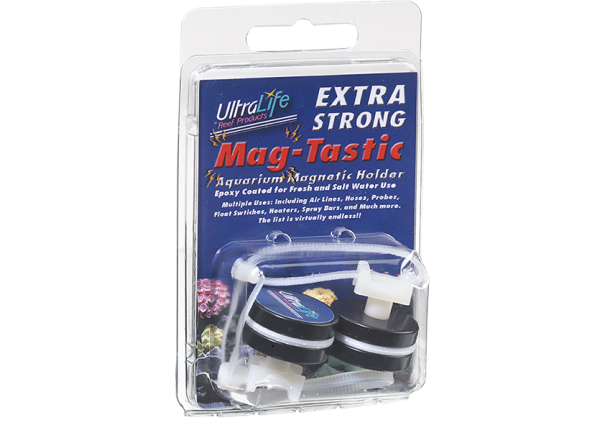 The Ultralife Magnetic Holder for Aquariums is a simple solution to a fundamental problem. This small but super strong magnetic holder has numerous applications. Such as securing sensors, probes, heaters, spray bars, hoses, etc. These products can efficiently handle all saltwater or freshwater aquarium mounting needs with ease. Strong enough to use with 1/2 glass aquariums and epoxy coated to handle the harsh conditions of a marine system. The unique fastening system that is used can be adjusted to hold objects with a diameter up to 1 inch.